File Transfer Protocol (FTP) is a network protocol that is commonly used to transfer website data from your local computer to the remote web server. This allows you to develop a website locally (on your computer) and then upload it to the remote server to be published to your website. This article uses the FTP client 'Filezilla' to illustrate examples. You can use any client you like to log into your server, as the settings are the same. Once you're connected and have uploaded your files, you can use the following article to create and edit files within Filezilla. To ensure a secure connection when connecting to your server, make sure to use port 22. This is also known as connecting via SFTP. View the 'Security' section below for further details. If you're need to log into your DreamPress site, use the following article instead. The following sections explain how to obtain each one. Do not add http://www in front of the domain as that may cause it not to connect. If you have added hosting to your site, but have not pointed your DNS to DreamHost yet, you can still connect to the server using the server's hostname. To find out what server you are on, log into the DreamHost panel and navigate to Manage Account. In the above screenshot the server is named ‘gervais’. So in this example, you could use the hostname gervais.dreamhost.com to log in. On this page, you can change the password. Update it and then click the Save Changes button at the bottom. After you’ve changed your password, please allow up to 20 minutes for it to update in the DreamHost system. 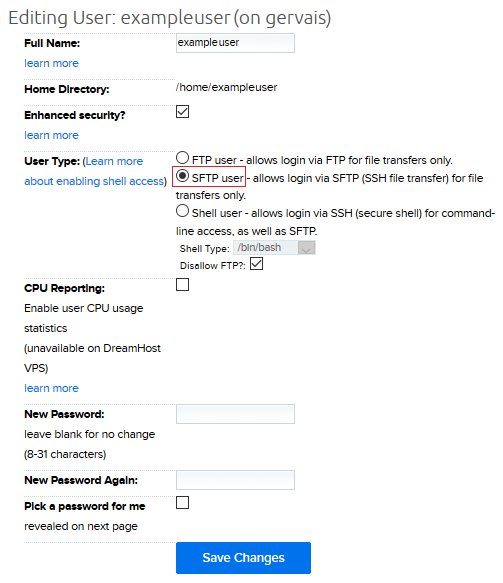 You can check if your user is an FTP/SFTP/SHELL user in your panel at Manage Users. It is highly recommended that you use port 22 with an SFTP or Shell user as it helps to ensure your data is safe when connecting. 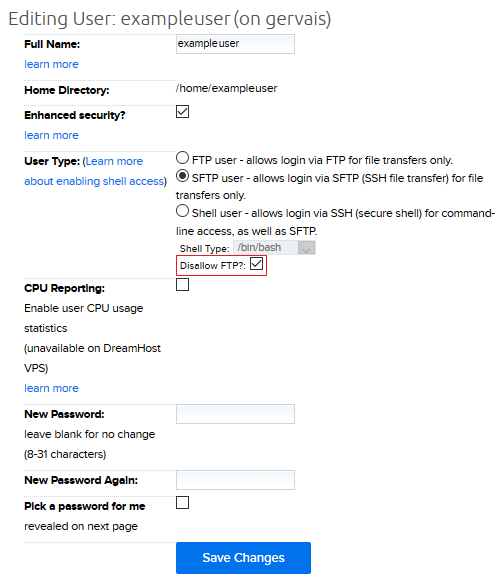 View the 'Security' section below for details on how to change your FTP user to an SFTP user. Unfortunately, FTP (port 21) is not considered a "secure" protocol. This means that incoming/outgoing data is unencrypted and in plain text. Because the data is unencrypted, an exceptionally sneaky person could eavesdrop on what you're sending. For this reason, it's only recommended that you create an SFTP or Shell user and use port 22 when connecting. SFTP is a network protocol designed to provide secure file transfer over the secure shell (SSH) protocol. SFTP is NOT just FTP run over SSH, but rather a new protocol. It is often called Secure FTP because it uses an encrypted transport layer. Click the 'Edit' button to the right of the user. Choose the radio button for 'SFTP user', then click the 'Save Changes' button. Wait about 20 min for the new settings to update. You can then log into your server using port 22. When you are editing or adding a new domain and add a new user during that process, it defaults to SFTP automatically and FTP is disallowed. If you have a VPS, you can completely disable FTP to further secure your server. Navigate to the Dashboard page. To the right of the server, click the 'Configure' button. Click the dropdown to the right of 'FTP server' and select 'Inactive'. Finally, click 'Save ps123456's settings' at the bottom to save. 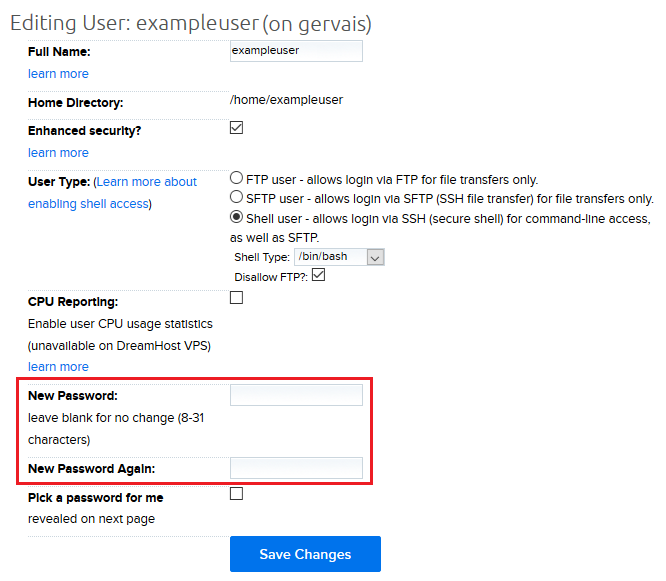 When logging in to your account using SFTP you may notice some differences from what you would normally see when you logged in with a normal FTP user. If you want to ensure that a particular user's home directory cannot be accessed by other users (even those in your same group) you can enable the "Enhanced security?" option for that user. You may notice that you can also access other directories above the /home directory. That's normal, as all users have some level of access to those directories. However, as a regular user you won't be able to view files that you don't have access to, nor are you able to harm the server. Hidden files/directories: On a Unix system, hidden files are those that begin with a period (.) in their name. As with FTP clients, SFTP clients usually have an option to "enable/disable viewing hidden files". If that is enabled, you'll be able to see these files/directories (if your user has permissions to do so). If you are having problems deleting a directory (assuming you have the correct permissions to delete) and it gives you an error saying "directory not empty", it may be that there are hidden files/directories in that directory that your client is not allowing you to see. Check your program options before going any further. If you do have the option enabled to view hidden files/directories and still cannot delete a directory, please contact support for assistance. Give support the server, user account, and full path to the directory you are trying to delete so they can investigate. View the How do I show hidden files? article for further information. View the following article for further information on how to confirm the key values you're seeing and log into your server. Article last updated April 14, 2019 22:42 PST.